As the game has changed over time so has the methods of gearing. I wrote an article last June that outlined the different ways of getting gear in order to participate in operations. Over the last six months, BioWare has made this easier to accomplish, but there are still a few little tips I’d like to share. It will most certainly save you some time and credits, at the very least. Upon reaching 50 you will be awarded 99 Tionese commendations which will fill out 80% of what you need in order to get into operations. I feel this is a great move on BioWare’s part because it allows more people to be ops ready right out of the box. There are still a few things players will need to fill out as 99 comms aren’t quite enough to get everything on the list. I recommend focusing on your 4 set bonus (if its worth it) as well as a main hand and off-hand since they are usually the hardest to get. The free recruit PvP gear you receive upon reaching 50 has been upgraded to the MK-2 rank. Still, these aren’t really viable for PvE, but if you are desperate for something to fill in a slot it will suffice. There are, however, some excellent relics that are available that no longer require rated warzone commendations. These used to be best in slot relics for PvE until the latest Dread Guard relics were released. Hopefully, you’ve done a bit of PvP on your way to 50 and can afford a relic or two. 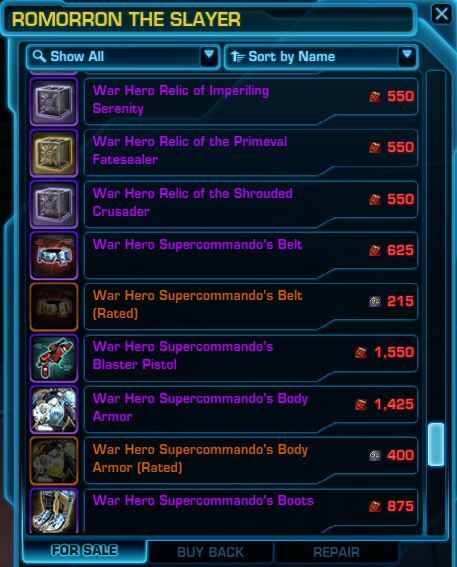 If you need to pick up some War Hero gear to fill in slots until a replacement PvE equivalent can be had then these aren’t a bad alternative. The group finder rewards are a great way to stock up on commendations. Not only will you be rewarded for running the daily, but there is also the weekly reward for running a random hard mode flashpoint. Of course, there are also the comms and gear that drop from bosses in whatever flashpoint you’re in, so there are plenty of excellent reasons to do your daily ‘HMFP’ as everyone calls it. The only one you may consider deselecting is the Lost Island Hard Mode. The risk verses reward for that flashpoint is a bit sketchy, at best. That is, unless, you have a well geared group available willing to carry you through it! 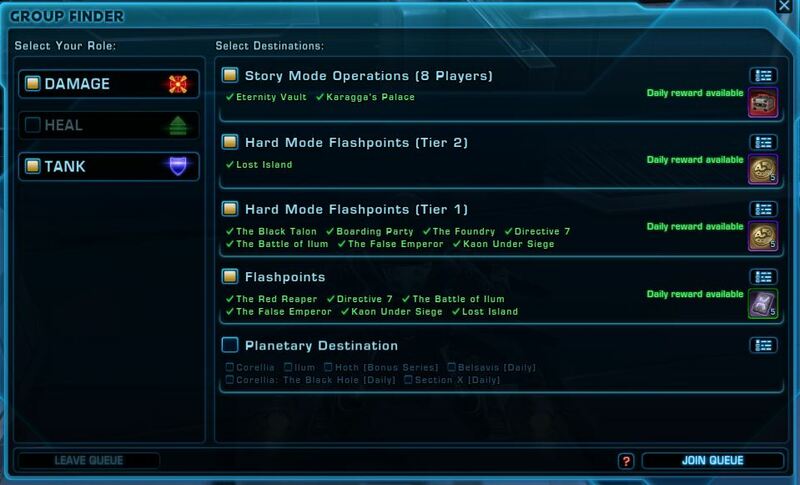 There’s also the story mode EV and KP that you can run which not only awards Black Hole commendations, but will give you a chance at some Columi upgrades. With as many daily quests as there are now, getting enough to a piece of gear doesn’t take nearly as long as it used to. Don’t get me wrong, daily quests are still tedious and time consuming, but if you want to do operations you need to have the gear. Some of the daily quest areas also have weekly quests which award Black Hole commendations. These aren’t as easy to get, but when you have enough for a piece or two it ends up being a huge upgrade over the entry level Tionese pieces. If you are a fresh 50 alt with a main character already geared then gearing up is so much easier for those with fresh 50’s. 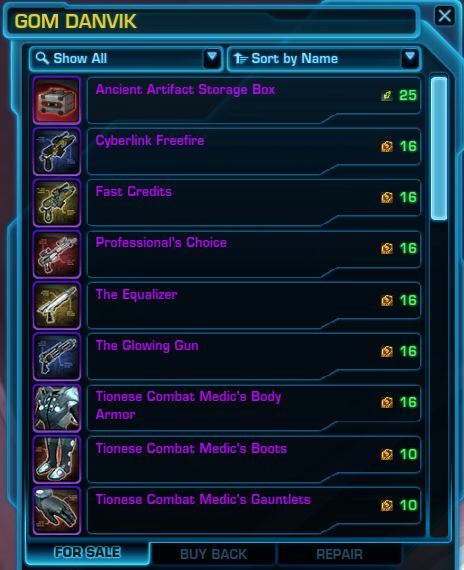 Take a stroll down to Dromund Kaas or Coruscant and visit your local legacy gear vendor. Using this gear you can shuttle the bound armoring, mods and enhancements that you pick up with your main character and send them over to your alt. 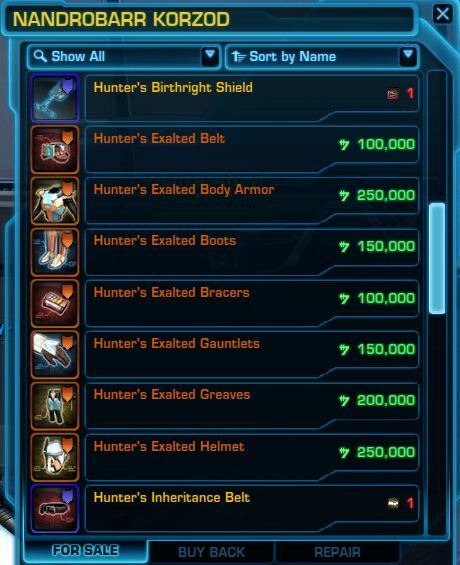 If you participated in the Gree scavenger hunt and were able to pick up one of the legacy weapons you will be able to move barrels as well. Unfortunately, legacy light sabers don’t exist, so hilts can’t be transferred. With any luck, we’ll see those very soon. The GTN is still a great way to pick up some gear for those who can afford it. 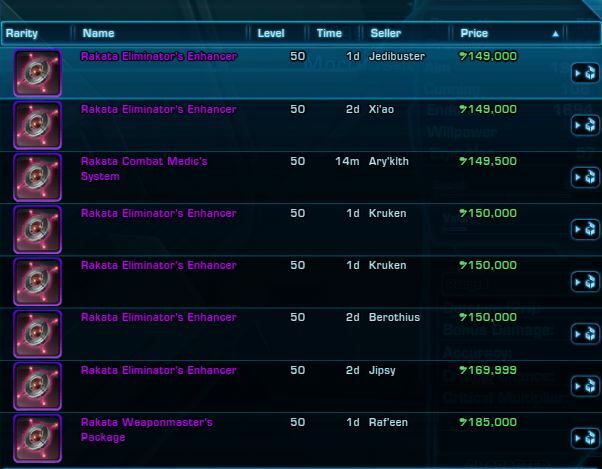 Columi implants and ear pieces sell at reasonable prices and even the Rakata implants can be had for a fraction of what they once sold for. For the extremely wealthy, the rank 26 and 27 armoring, mods and enhancements are major upgrades if you are willing to pay the prices. It is amazing to see how much change the game has gone through over the last six months. I feel that BioWare is on the right track with the gearing and operations content. It’s easier for new players to get geared up which, in turn, makes recruiting them not as big a deal since they can be quickly caught up to current level gear. I am certainly looking forward to what the next six months hold in store.